With holidays rapidly approaching and the media stories about contaminated ice still fresh in the mind, now is the time to take another look at your ice machine cleaning and maintenance schedule and make sure it’s fit for purpose. 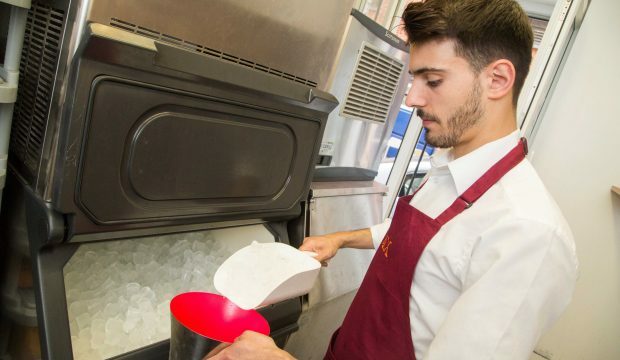 While most people would consider maintaining hygiene as vitally important for the smooth running of any foodservice business, it is fairly easy to overlook the inner workings of the ice machine as part of the regular cleaning schedule. However, the importance of keeping your ice machine clean cannot be overestimated. Putting in place a regular cleaning and maintenance schedule should keep the nasties out of your ice. Done correctly, it will not add much to your staff’s existing workload. This schedule should be divided into three phases: daily tasks, monthly tasks and those done every six months. Daily cleaning tasks include sanitising scoops or tools used for removing ice from the bin. These should not be stored in the bin. Cleaning the external surfaces of the ice bin with food-safe sanitiser, paying particular attention paid to areas touched while opening the storage bin. Finally, carry out a visual inspection every day to ensure no contaminants have entered the storage bin. If there is anything present that shouldn’t be, the ice should be immediately discarded, and the bin fully cleaned. Every month you should be doing a full and deep clean of the unit according to the manufacturer’s instructions. This involves switching it off and emptying out all the ice first. This is a good time to remove and clean the air filters as well, and if your machine uses an anti-bacterial system that should also be replaced. Finally, water filter cartridges should be replaced every six months. This will prevent limescale from building up, helping to guarantee crystal clear cubes as well as helping to prevent bacteria entering via the incoming water supply. Alongside these cleaning routines, it is also a good idea to reiterate the training you give to staff to make sure they are fully aware of best practice recommendations for handling ice. The primary cause of contaminated ice is human contact. It can be easy to overlook the actions required to limit the chances for contaminating the ice supply during the everyday bustle of work, so making sure they are aware of what is required is vital. For example, ice should never be handled with bare hands, always use tools, like tongs or scoops. These should be cleaned and sanitised at least once a day to keep contamination under control. While human contact is the biggest vector for bacterial transmission, the storage bins should remain closed to minimise bacteria falling into the ice from the air. For the same reason, never use the ice bin as a method of cooling other items, for example bottles. While cleaning procedures can be comprehensive on paper, if your staff are not trained properly and made fully aware of the risks of serving contaminated ice to customers it makes no difference. Taking the time to review both your procedures and your staff’s training will help to prevent risks to your business’ reputation, and more importantly, your customers’ health. Full cleaning guides can be downloaded from the Scotsman Ice website here: https://www.scotsman-ice.co.uk/downloads/ . The site also has a series of videos demonstrating exactly how to clean various ice machines.